Heat oven to 375°F. In 10-inch skillet, cook ground beef over medium-high heat 8 to 10 minutes, stirring occasionally, until thoroughly cooked; drain. Stir in 1 teaspoon of the chile powder, the cumin and pico de gallo; cook 1 minute longer. Remove from heat. Stir in sweet potatoes, 1/4 teaspoon salt and 1/8 teaspoon pepper. Unroll pie crusts; cut each into 6 triangles. Spoon about 1 1/2 tablespoons beef mixture in center of each triangle. Brush edges with water. Bring corners of dough together over filling; pinch seams to seal. Place on large nonstick cookie sheet. Bake 28 to 35 minutes or until light golden brown. Meanwhile, in medium microwavable bowl, microwave preserves on High 30 to 60 seconds, stirring once, until hot. Stir in remaining 1 to 2 teaspoons chile powder. 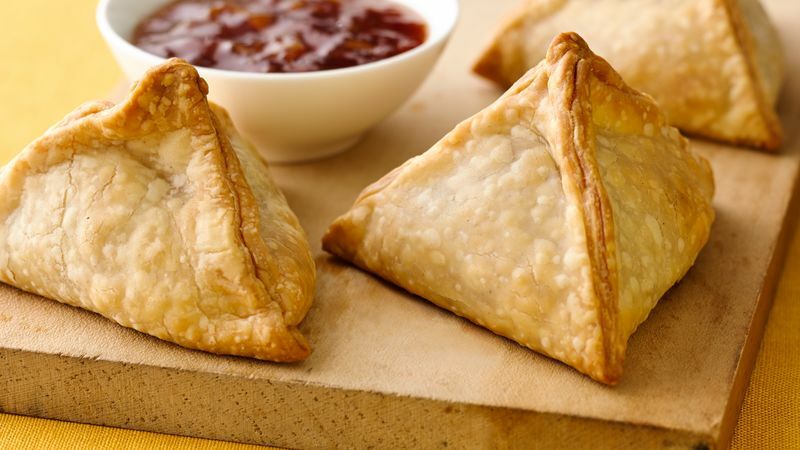 Serve warm with samosas.